This 2 or 3 bedroom townhouse is the perfect mix of quiet and convenience, with gorgeous views overlooking the greenbelt. The first level features a bedroom/office (zoned for work) with a spacious bath and access to a fully fenced yard backing onto green space. Upstairs you'll find an open concept living / dining / kitchen area with granite countertops, stainless steel appliances, and high ceilings, with two additional bedrooms each with their own bathroom on the top floor. The balcony off the kitchen is perfect for a grill! 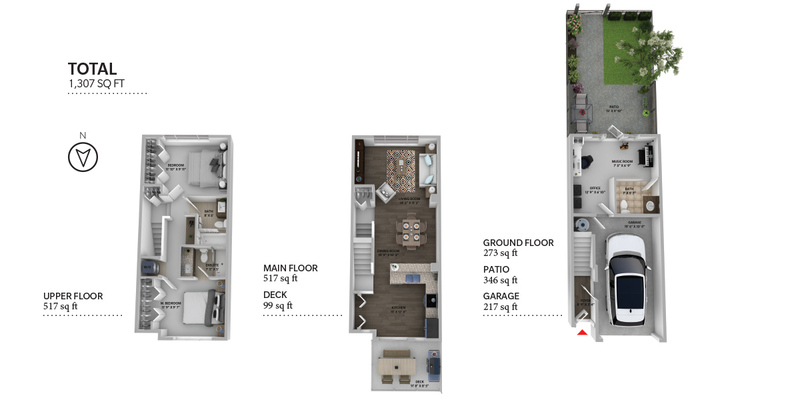 Practical features include 3 bathrooms, insuite laundry, a single car garage with a carport for 2nd parking, and pre-wired for a security system. Walking distance to Morgan Crossing, restaurants, Sunnyside Elementary School, Southridge Private School, Aquatic Centre and more!